How do you feel about reaching the quarter-finals? I'm happy I beat a player who's doing well lately in TaeJa. You lost to him once at MLG, how did you feel coming into this match? 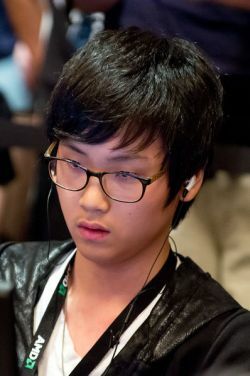 At MLG, I was a bit nervous playing my first international tournament, and I wasn't really familiar with TaeJa's style. Also, I hadn't practiced much on the first map Shakuras Plateau, so after I lost my first match I went on tilt and I went on to lose the second match as well. I'm glad I was able to get my revenge this time. Did it help that he had played a lot of tournament games lately and was thus more exposed? Yes, the ASUS ROG and MLG games helped me figure out his style. However, I think he intentionally changed things up for this series by using more early aggression builds. The matches were timed so you played them before the IPL TAC3 grand finals, where your two teams meet. Were you worried about giving away information? I worried about it a little, but I don't think it matters because there's more to lose on his end. Your RO8 opponent will be the winner of Sting vs Darkforce. Do you prefer either one of them? 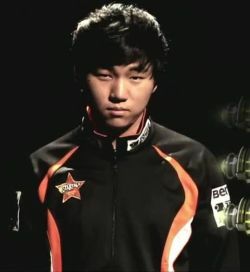 You beat a lot of well-known Terran players at MLG. Do you think your PvT is your best match-up? I think my versus Zerg and Protoss are pretty much the same. You happened to lose to SortOf in your first series at MLG. Well, there was some tiredness from playing late on the first day, but also I was just caught off guard by going to MLG without information on the foreign players. You've had broadcast experience playing in the Proleague as a Brood War pro, but you said that you were still nervous at MLG. How's the environment different? I think because Arena had no audience, I was at least less nervous than I could have been. I'll have to see how it is at Summer Championship, haha. I was nervous in Proleague because it's a team competition, but I tend to be less nervous in individual competitions, so I think they're alright. Speaking of Summer Championship, are you preparing to do anything to win over the fans there? You have to win to win them over, so right now I'm just focusing on practice. So it's too early to do Seed ceremonies? I'd like to say thank you to my head coach for taking care of me, and my teammates for helping me practice. I have many games coming up, and I hope I can keep winning. Also, I hope LG-IM wins the IPL TAC! How do you feel now that you've reached the quarter-finals? I'm happy to win a hard fought victory, and I'm even happier now that there's only a few steps left until the finals. You won very easily in the first round of the tournament, but this match was much tougher. Did you let your guard down? No, my opponent was just very good, and it made it hard to win this time. There was a lot of ZvT imba talk right after the queen patch, but recent tournament results suggest that Terrans are finding a solution. What do you think? I think it's clear that almost all Terrans are finding solutions in playing late game macro games instead of trying to be strong early. You lost the first map playing a macro game. Did that affect how you played out the rest of the series? I didn't know the skill level of my opponent so I planned to play the first game as a macro game. After that I just went with the overall gameplan I had thought out beforehand. I even expected that he would go for an early rush on Entombed Valley, but I wasn't able to stop it because I made mistakes. Were the blue-flame hellions on Daybreak planned beforehand, or was it a reaction to tendencies you noticed in his play style? It was something I tried after I noticed his tendencies, but I thought I was screwed when his overlord scouted it out. However, he wasn't able to react to it correctly. Your next opponent is MajOr or JonnyREcco. Do you prefer to face a specific player? JonnyREcco. MajOr is a good player on the Korean ladder, so he will be tough. Did you play MajOr on the ladder much while he was in Korea? Yes, I think we both won and lost against each other. For that reason or something else, I just have an image of him as a good player. On a subject outside of the game, Seed recently mimicked your ceremony in a WCS victory. Did you see it? Yes, haha. I thought it was funny and was envious at the same time, thinking "I was like that, once," haha. LOL is it? More than that, I just felt bad for CoCa. Because of the WCS break, a lot of Korean players are fairly free. What have you been doing? I've just been preparing for TSL, and for the upcoming WCG Korean nationals and Up/Down matches in September as well. Do you think you've improved a lot in this period? Yes, it's not to a degree that I'm happy with yet, but if I keep working hard I think I can bring my skill back up to where I want it. Will we have a chance to see you at upcoming foreign tournaments? Well I lost in the second IEM prelim, so LOL for that one. MLG, if my schedule permits, then I might be able to participate. By the way, your English has been really good when you talk to our American admins. Would you mind saying something in English for your fans? Oh, hahaha. That's not my English skill, it's my teammate Galaxy, who studied abroad. You eliminated Vortix, who can solve a Rubik's cube in thirty seconds. What are you bringing to the table to make up for that? Wow, that's impressive. I don't have anything like that. T_T. Okay, any final comments then? First, I want to say sorry to Vortix because the game was delayed for so long due my internet problems. I want to play well and impress in TSL4. Please keep cheering for me, and thank you! How do you feel about reaching the Ro8? I'm very happy, but my next opponent (Curious) is tough, so I'll need to practice a lot going forward. You've said in the past that you're confident in Zerg vs Zerg. Is Curious a hard opponent for you? Yes, he's a tough opponent and he's on the same team as well, so I'm feeling a lot of pressure. Speaking of Startale teammates, you've spent some more time at the Startale house since we last interviewed you. How's it going? Hmm, I think my skill has improved a lot, and practicing just goes better. Has the way you practice changed a lot? In the past I was pretty confident so I goofed off some and played other games, but since I lost to Leenock in Code A, I've been practicing very hard. You played some less common openings, like mass speedlings in game one and the a very fast mutalisk build in game three (like the one you used against Jinro in the GSTL). Do you enjoy mixing things up like that? Yes, my style is to use builds my opponent doesn't expect, and I like playing aggressively. Terrans have shifted towards trying to beat Zerg in the late game these days. Has this made ZvT easier or harder for you? I've always liked playing the mid-late game, so it's become a bit easier for me. Compared to ZvT or ZvP, you tend to play a fairly standard, defensive ZvZ style. What's the reason for that? Zerg vs Zerg is about seeing what your opponent is doing and then making your own choices, and I found that if I attacked first, I usually ended up getting behind. So I mainly play a defensive style, and I'm confident in playing macro games as well. What do you think of the creep changes on the balance-test map? Honestly, creep is so imba it needs to be nerfed. If you get good spread, Terran just can't move out. How have you been spending this month with no GSL games? My school went on vacation this month, so I came to the StarTale house and I've just been practicing. Thanks to my foreign fans for cheering me on! How do you feel about getting into the quarter-finals with a 3 – 0 victory? Well my opponent came up after defeating Nerchio, so I felt a lot of pressure and really practiced a lot because of it. I think that’s why I was able to win by such a score. Was 3 – 0 surprising even for you? I thought I would maybe win 3 – 1 , but I didn’t expect 3 – 0. Your in-base barracks-supply was stopped fairly easily by DarkForce in the first game, but you came back to win anyway. Was that your prepared plan B in case your early cheese failed? Hmm, my original idea plan was for everything to go unscouted until the bunker finished, and have the game pretty much end there, but I got messed up when my strategy got scouted and blocked fairly easily. Still, it was a strategy I had used a lot on ladder, so I just improvised the rest of the way and it went well for me in the end. On the third game on Entombed you went for mass-hellions into a mech transition (though the game ended quickly). Do you usually mix in mech style in TvZ? Ah, that specific build and mech style in general was recommended to me by Startale’s Aphrodite. I really didn’t have any good ideas on what kind of strategy to use in the third game, so it was great that I was able to win a 3 – 0 victory with the strategy she suggested. Thanks again! A lot of Terran players are playing longer macro games in TvZ these days, but you went for builds that gave you an early advantage. What’s the reason behind that, and what do you think of TvZ these days? When I meet really good Zerg players, I lose so badly that it makes me not want to play the game. Against those players, I can occasionally win a game with a 2/2 upgrade timing, but outside that I can’t win. When I see Terran players who can win with late game management, it makes me appreciate how good they are. I only really feel comfortable if I take a big advantage, or win the game outright at the 2/2 timing. A recent balance test map was released with a creep nerf. What do you think about it? I don’t know the details, but creep really does spread too fast. I don’t know if it should be nerfed, but I guess it’s good news for Terran since it’s almost impossible to handle a Zerg who spreads creep well. You left NSH recently. Are you looking for a new team? Is it hard to prepare for a tournament without a team? Ah, not really. There’s a lot of great players in the Skype groups I’m a part of, and I’d like to thank all the people who helped me out. Speaking of joining a foreign team, Crank has had a lot of success lately by appealing to the foreign community by using English a lot. Any efforts from you in that regard? Ah, really? I’m chobo at English T_T. I’m thinking of taking English classes these days, if that will make it easier to find a team. Your next opponent is First, who you beat 3 – 0 in the preliminaries. What do you think about the rematch? First likes to play greedy, so in the prelims I used a lot of early kill builds without feeling any pressure at all. Now that it’s the actual tournament… he’s tough, but I think I can win. You’ve ended up getting matched against every race this tournament. Which match-up are you most confident at? I’m confident against the weakest race, Terran, LOL. There’s almost only Korean players left in this tournament. What do you think of your chances to win it all? Looking at the bracket, I thought the quarter-finals would be the real hump. If I can make it to the semi-finals, I think I have a shot at the finals. So you’d be confident against players like CoCa, Creator, Hack etc. in the semis? Well, I read the TSL4 review, and there was some stuff that said I wasn’t qualified to be in TSL4 T_T. But I think even if I’ve only ever been in Code A once, and that one time I was instantly eliminated, I’m still confident against anyone if I play them online. So please keep watching me! Any shout outs? Final comments? I’m good in online tournaments, and I want to be good in live tournaments as well. I think I’ll be able to realize my potential. So foreign teams, feel free to contact me ^^. Also, thanks to my skype family and ‘Minsu’s family!’ TaeJa told me when TSL4 started that we should advance together, so I’m sad that he was eliminated… but if he had advanced, I think I would have lost so it’s fine anyway LOL. Also, First beat Yonghwan hyung (Sculp) a bit back, so I’ll avenge him! Finally, thanks to Aphrodite for suggesting that strategy to me. I’m happy, just really happy. You won easily against a tough opponent, how did you do it? I’m on a roll lately, and I’m confident against anyone, whether it’s weak or strong players. You actually lost an important GSTL game against CoCa because you made some mistakes in the late game. Did that game affect how you prepared for this match? No, it didn’t really matter. Including that game, you’ve lost some broadcast games recently when you took it to the super-late game against CoCa and Curious. What happened there? Your PvT is what made you famous at first in the international community. What match-up do you feel best about lately? I’m most confident against Zerg these days. Your next opponent is Hack. What kind of player do you see him as? He’s a player who tries to go for a variety of styles, but he’s also good at macro games. He even used mech against you in the prelims. Is there anyone who still goes for mech these days? Protoss is doing well lately, so the Protoss imba talk is coming out again. What do you think about that? Protoss should absolutely not be nerfed. I think the better player wins, so us players should leave balance to those in charge of that, and just focus on practicing hard. You have WCS to prepare for as well this month, with no GomTV games. Have you found yourself with more free time than usual? If so, how are you spending it? No T_T. I’m considering TSL4 and WCS the two major leagues for me, and I’m busy preparing hard for those two tournaments T_T. Any chance of seeing you at MLG or IEM? The KeSPA players are a hot topic in the WCS tournament. As a player, does it interest you too? Yes, of course. I haven’t played any official games against them yet, so I don’t know about the pressure, but the pressure must be insane for the players who do have to face them. Were you a fan of any particular player before you became a pro? Ah, I was a fan of Flash in the old days. So you’d like to play him? I really want to win TSL4. I’m a bit sorry to CoCa, so I want to cheer him on. I will work hard and practice hard, so I hope lot of people cheer me on. Thank you! I'm glad to progress, and I'm a bit giddy at the thought that I only have to get through two more players to reach the finals. You used a lot early attacks in this series. What was the reason? I had a busy schedule, so I couldn't prepare that much. So instead of going for something different, I just used the aggressive strategies I use a lot normally. HasuObs beat ThorZaIN last week, did that affect how you prepared? As I mentioned, my schedule didn't permit much separate preparation. I just planned out what builds I wanted to use, and practiced based on that. You're going up against Creator now, a player you faced in the preliminaries as well. How do you think the games will play out? I think it will be extremely hard. However, I do think that in TvP, you can make things work if you can just prepare strategies well, so it's not like it's impossible. You impressed with your mech play in the TSL4 prelims. Is that something you still mix in now and then? I use it occasionally, but not as often as before. There's still so many things that need to be tweaked, so I don't plan to use it much in the near future. Almost all the foreigners are out of the tournament now, and it's likely to be an all-korean final. What do you think? I expected the finals to be between Koreans, but I was pretty surprised that a lot of the skilled foreigners were knocked out so early. So what are your chances of getting to the finals? I think as long as I can beat Creator, I have a good shot. They say that there's a huge amount of pressure when facing a KeSPA player. How did it feel when you played against RorO? The pressure was extreme. I had heard RorO was good, and add on the nerves from playing a broadcast game, and I found myself losing without really knowing what happened. 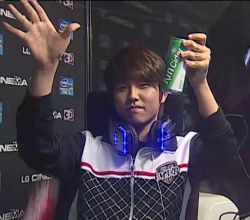 You have WCS and TSL4 right now, then WCG and GSL coming up in September. Is it hard to practice for so many tournaments at once? The period between tournaments is so short, so I can't prepare perfectly for any of the tournaments. I just focus on the tournament that's right ahead of me and do my best to practice for that, while just keeping my basic strategy in my mind for the other tournaments so I can start practicing for them immediately. Though I lost in WCS, I still have losers matches and many other tournaments left, so I will be better when you see me next. Keep cheering for me! How does it feel to get to the Ro8 with a 3-0? Did you expect it to go so well? It feels so great to advance through another round let alone go 3-0 . I didn't quite expect it to go 3-0 , I was expecting a closer fight, something like 3-2 to happen. Did you do much research on Major? Did you expect the builds he used against HyuN during this match? I watched him play vs Hyun but I didn't really take much from it, it just seemed like normal ZvT to me. Apart from him vs HyuN I couldn't really find anything recent so it was just that. The games all went pretty long, did you feel like you were in trouble at any point? Especially in the game on Entombed. The only game where I felt a little worried was on Entombed Valley where I had a 200/200 army but he was doing a lot of drops and had killed a lot of my drones and some hatches. Then after one of the fights when I had 160 food I thought I was going to lose because he had the better economy. But when the final deciding battle came he clumped up all his vikings and attacked into a tight space where fungals just destroyed everything. At ASUS ROG 2 weeks ago you played a really close series with fOrGG, did that help your confidence in ZvT a lot? At ROG I already felt my best match up was ZvT. I just didn't play as well as I should have vs fOrGG, so I felt good going into this set of games either way. Have you seen the proposed balance changes on the Antiga custom map? What do you think of those? I saw them, the raven speed increase is alright I still think ravens are amazing as they are but that'll make them even better. The creep spread change I don’t think it'll change much at a high level if you can keep up with spreading creep already, it'll just be a nuisance getting it up ramps now. Are you ever surprised that more Terrans don't use ravens in their late game army? Yeah I am. It’s crazy that they’re not used as much, when in 200/200 battles a few ravens with pdd put out in air battles makes it so that corrupters first few volleys are completely negated, I can understand it in games where it’s low eco always fighting going on but when it’s just waiting for minutes at a time it doesn't make sense not to have them. 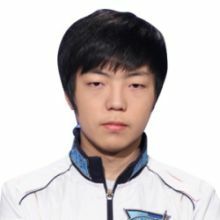 Do you feel confident about your chances ZvT against KeeN? I’m quite happy that I got KeeN over VortiX, like I said ZvT is my best and favorite match up to play so I feel pretty good going up against him. A lot of the Koreans are winning in this tournament, are you afraid of any of them? Do you feel confident in your ability to play against them? Well I used to think that Koreans were just invincible and impossible to beat until I noticed they were just like any other person, just very good. :D I’m not scared of any of them but I don’t underestimate them either so I just play my standard game. If I had to pick one that I wouldn't like to come across early then it would be TaeJa but I would only face him if I got to the finals. You keep demonstrating how strong your ZvT is, how do you feel your ZvP is? My ZvP's been pretty good for a while but just recently I've learned a few things about the matchup and I’m able to read Protoss a lot better. I feel like that’s going to improve my ZvP a lot. I would still place my ZvT ahead of it but it’s not far behind. How have your first few weeks in Dignitas been? Anything big planned for the future like LANs or mostly focusing on TSL now? It’s been pretty good so far, I qualified for IGN ProLeague Season 5 so there is that and then there is i46 offline tournament in the UK really soon but apart from that stuff along with TSL and WCS EU there’s nothing else confirmed at the moment. So before we go I have to ask, what made you pick the ID JonnyRecco? Well basically I had watched starship troopers a lot back when I started to play a game called Planetside, I chose one of the characters names in the film for my name and since I was young I spelt it like it is. And then since I played Planetside for so long I've just always used that name for anything since then. Ahhh that's a fitting name for Planetside. Are you excited about Planetside 2? Could be the start of a new progaming division in Dignitas. Any last words or shoutouts you want to make? Well thanks for another interview . Thanks to Team Dignitas and the sponsors and thanks to everyone who supports me. Oh and before anyone asks, the Curious interview will be forthcoming. It's funny how the youngest players have the shortest answers. Haha, Aphrodite is so smart! nice to read the interviews. I wonder how long it will take for GOM players to not feel extra pressure when facing Kespa players. Just out of curiousity, will the rest of the Ro32 interviews be released? Cool to see Aphrodite having an impact on a big-ticket game. yay thanks for the interviews!! Some foreign team probably should grab Sting asap. Not the most popular player but a good, solid one for sure. hack and johnny made it! hack is good at seeing his chance and capitalizing. i was thought hasu was going to butcher him after hand one, but he really impressed me. i wonder how far he will go. Exactly what i thought after reading them all... it was sort of boring that most koreans only had one sentence to say which was usually shorter than the question itself. But the interview with Sting was pretty good! Awesome. I love reading Koreans getting interviewed, and the questions asked in these are so much better than the TiG ones (though they're obviously still good). I don't know who to cheer for. I like them all T_T Some people have said that they don't care about TSL4 any more because so many foreigners are out, but all of these guys are awesome players and personalities. Thank you, read my mind. I want to hear from the player who beat Squirtle. C'mon Keen, win it all!!! we ride together we die together KT for life.